“We found your website while looking for some willow baskets for a display. We were hoping that you might be interested in bidding on our project.Please let us know as promptly as possible if you are interested” read the email that we received on a Friday afternoon. On Monday Katherine sent back a list of questions and arranged to speak by telephone that afternoon. That’s when the project coordinator told Katherine, “My boss said, ‘This is just a mom and pop business. They’re not going to get back to you. '” But Ann had responded, “Sure they will, this is how they make their living.” Mom & Pop on the internet selling their wares and services have to be ready to respond to potential jobs, especially in the current economy. Spaeth Designs in New York City has built a reputation on window displays. They are known for the animatronic windows that they produce for stores like Saks Fifth Ave and NBC in NYC and Marshall Fields in Chicago. They also do special events and promotions. The job they contacted Katherine about is one involving some hot air balloons. They needed a basketmaker to make replicas of four balloon baskets of different sizes. They had some drawings done but not really the details. 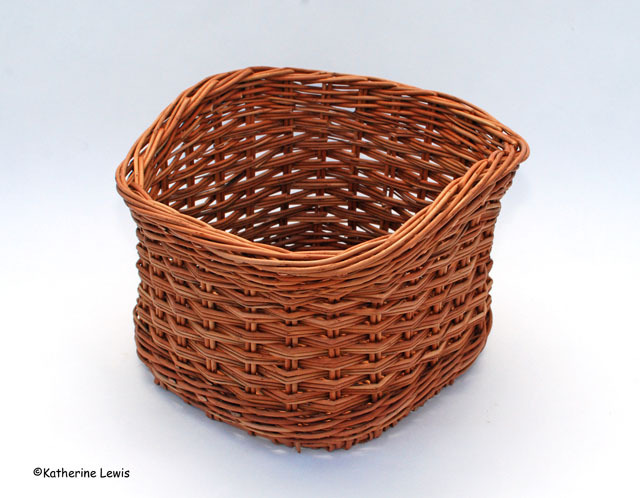 On Tuesday, Katherine soaked up some willow and went about weaving a sample basket. Later in the day, she told me that we needed to get some photos done and emailed by the end of the day. The Spaeth crew was meeting with their client the next morning and needed photos of the sample and a price quote before the meeting. So I got out the camera and opened up the Photoshop while Katherine worked the bid. Wednesday afternoon we heard the boss was surprised we managed to get the sample photos sent, but also that the project is over budget. So they aren’t sure what is going to be kept in the final display. “We’ll let you know by the middle of next week at the latest.” Ironically, we are still waiting for a reply at week’s end. Must be their client’s fault. You know those big retailers never get back to you on time. Post script: To save cost they decided to make solid boxes with “a covering of some sort”. They did say, “We want to thank you for being right and ready to hop on the project at a moments notice…” Maybe a future project will come our way.